A parent hack can be as simple as putting the ketchup under the hot dog, minimizing the mess. Or strapping baby into a forward-facing carrier when you need to trim his fingernails—it frees your hands while controlling the squirming. Or stashing a wallet in a disposable diaper at the beach—who would ever poke through what looks like a used Pamper? 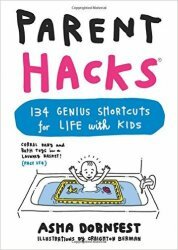 On every page, discover easy-to-do, boldly illustrated, unconventional solutions, arranged by category from Pregnancy & Postpartum through Sleep, Eating, Bath Time, Travel, and more.